The above chart shows the dates of the first observed appearances of fourteen species of migratory birds in Roberts Bay during July and August, 2015. These observations are plotted on a graph of the difference in air pressure between the prairies and Victoria BC. 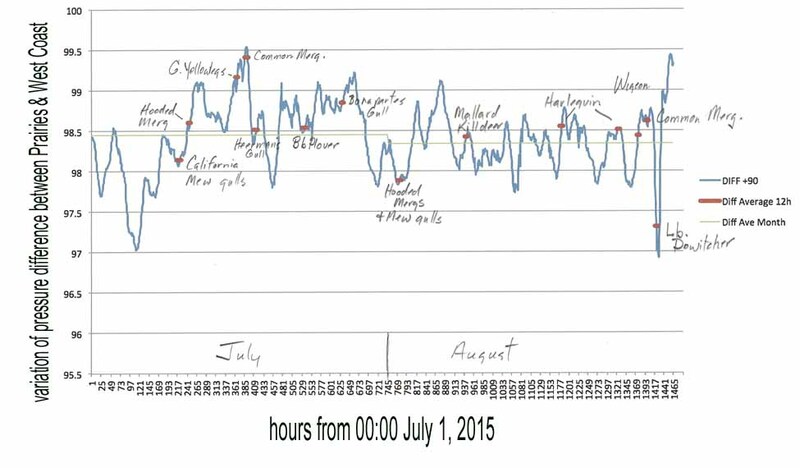 The red bars indicate the half day period between midnite and noon, my prime observation period. These records do not necessarily reflect their actual arrival time. Some species will arrive on the outer coast before they appear in the bay. Nonetheless, it is apparent that they tend to appear when the pressure differences are highest, indicating a coupling between migratory movements and continental scale meteorological features such as Rossby waves.